hotel room, done with the apartment search and tons of crazy paperwork. Finally I'm sitting in a place that I'll call home for the next year. this space comfortable to live in. I will post a decor post once everything is up and ready to be presented. How do you like this combo? I felt really comfy and stylish in it. I'll def. re-wear this outfit sometime again. Oh i love it! Such a cool style! Check out my new post on my Fashion & travel Blog about "My Walk-in Wardrobe"
Love this look so comfy yet chic . and lovely pictures too. Love that outfit - great top. Love love love!! super in love with this Denim dress! ;) Fantastic. I love shabby denim with burgundy - it looks awesome! if you want to follow each other follow me & I'll follow you back! Woooohooo LA! Moving is rough, isn't it? I adore this combo. The denim dress is fantastic. Welcome, where did you move here from? Loving the under shirt, that color looks great on you! košuljica je divna, a sviđa mi se i taj haljinica od jeansa. Very cute look! Have fun decorating your new home. It always feels so refreshing to do so. Oh I absolutely adore that shirt!!! And the bag is just lovely!!! So cute! I love the denim dress and those shoes! Nice jeans dress, very pretty, I like!!! This is the cutest dress and top combo ever!! So perfect for the LA lifestyle. And congrats on your new place! You must be so excited! 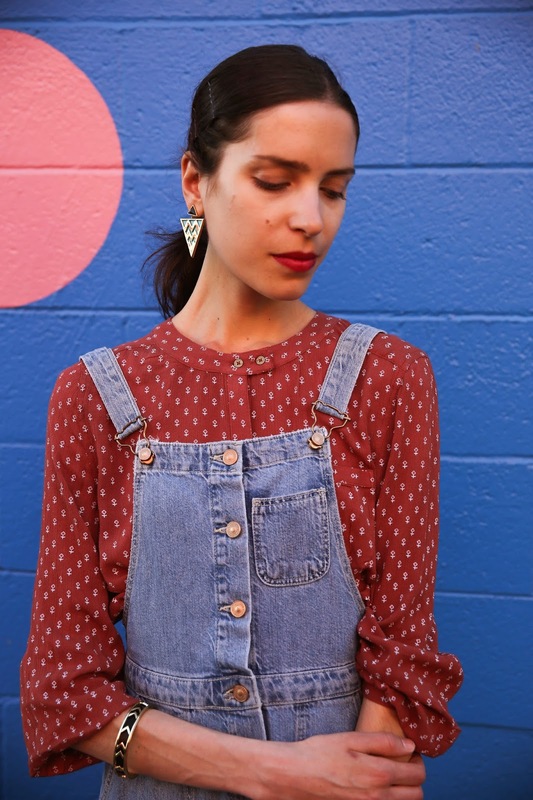 Those are not your typical overalls, and they're darling with the polka dot top. Cute casual look!